Why Choose Our Neck Pillow? - Perfectly Support The Head And Neck In Any Sitting Position. - Soft And Durable Fabrics Provide Maximum Comfort. 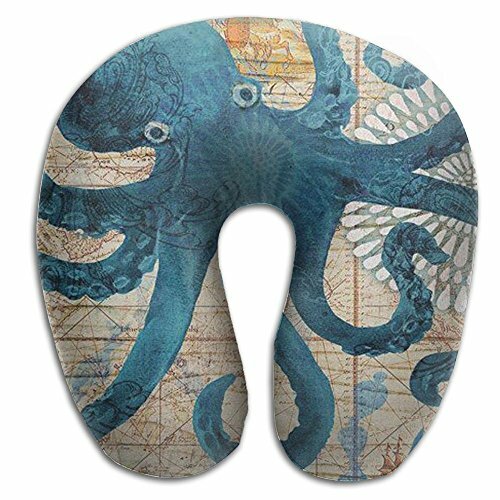 - The Octopus Ocean Animal Travel Neck Pillow Is Scientifically Tested To Be The Ideal Pillow For Those Suffering From Chronic Neck, Shoulder, Or Upper Back Pain. - This Awesome Octopus Ocean Animal Neck Pillow Is The Perfect Travel Pillow Even For Those Who Don¡¯t Travel. - Sleep Peacefully All Throughout Your Flight Or Journey. - Great For Traveling Use In A Car, Truck, Bus, Train, Or Plane, And Also For Lounging At Home Or By The Pool. Travel Pillow Material: 100%Polyester « Memory Foam. Ergonomic Design: Classic U Shaped Design Octopus Ocean Animal U Shaped Travel Pillow Memory Foam For Airplane Supports Neck Perfectly, Prevents Head From Falling Forward, Stops Neck From Leaning On Neighborhood. Easy Care: It Is Durable And Fully Machine Washable. Gift: A Perfect Travel Accessories Gift For Your Family Members. It Will Last For Years Of Use And Will Remind Your Loved Ones That You Care About Them. Multiple Situations: The Portable Octopus Ocean Animal Airplane Neck Travel Pillow Is Best For Traveling Use In Car, Truck, Bus, Train, Or Airplane. Use It While Watching TV On The Bed Or Couch, Reading Book In A Camper Or On The Beach Ect. If you have any questions about this product by USYCHATS, contact us by completing and submitting the form below. If you are looking for a specif part number, please include it with your message.